Well I’m obviously delighted to have had 2 photographs win across the 11 weeks of the photo comp on Adventure Eyes – but I’m double pleased to have been selected to be the overall winner. 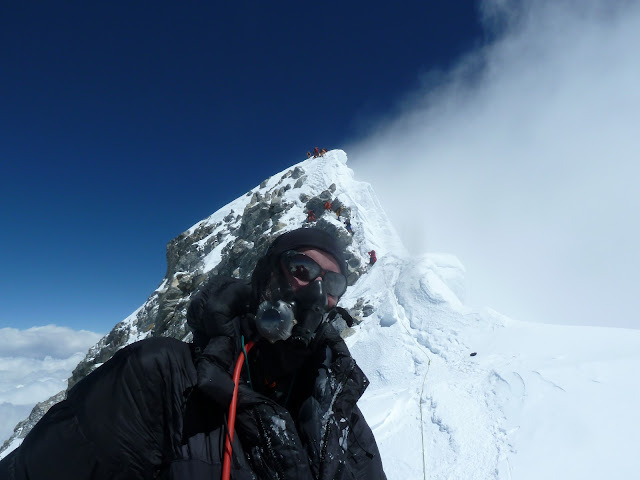 Busy getting ready for Ama Dablam in just over 2 weeks – it’s all getting a bit manic now but I still have my head above water. Looking forward to seeing my Sirdar and Climbing Sherpas again not to mention my friends in Kathmandu and along the Khumbu Trail. How exciting. Just been sent this photo from Dave Hill (he who I mentioned in my last Blog post about our meeting on the summit). He very kindly popped this across to me – it’s on descent from the Summit of Everest with The Hillary Step just in the background.